Those following these posts know that sumac has been one of our serious threats and that we have worked out methods for its eradication. One of the secrets is early detection followed by immediate control. Because of its intense red color in the fall, this is an ideal time for making sumac surveys. High quality prairie remnant being invaded by three sumac clones. Left unchecked, these clones might eventually take over the whole site. For the two sites that we manage, we have worked hard to eradicate sumac. Our goal is to have no sumac on the site, not even single plants. We wait patiently for sumac's intense red color to develop and then do a thorough canvas. We pick a good day when the sky is clear and the sun is shining. Yesterday was perfect and Kathie and I spent most of the day looking for sumac plants. A good pair of binoculars is very useful, as single patches of red on a hillside can be due to various species, most of which are lots less harmful than sumac. These include woodbine (Parthenocissus quinquefolia; intense red), hazel (Corylis americana; deep maroon), and gray dogwood (Cornus racemosa; dark red). Only sumac has compound leaves, which are usually easy to discern at a distance. 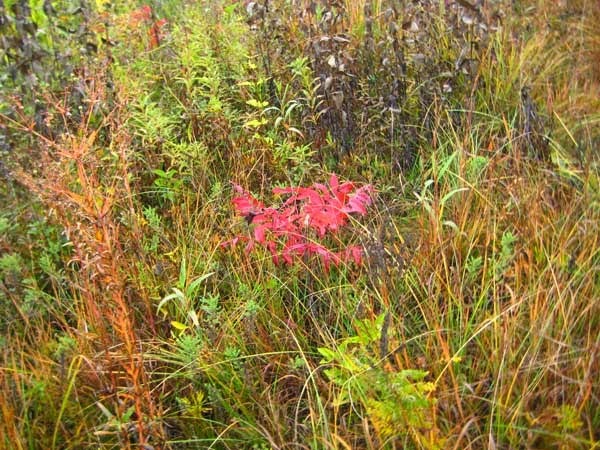 The photo below shows how easy it is to spot a single sumac plant. At Pleasant Valley Conservancy we found 10 single plants scattered over about 50 acres of oak savanna. None of these were on prairies, either planted or remnant. Only two patches were clones, but each of these was small (ca. 5 feet in diameter). When found, clones or single plants can be immediately treated by basal bark with Garlon 4 in oil. It is important to even treat single plants, because each plant has the potential for forming a clone. It was indeed satisfying that we saw so very little red! At Black Earth Rettenmund Prairie we found only one clone of any size, and this was on the neighbor's pasture. 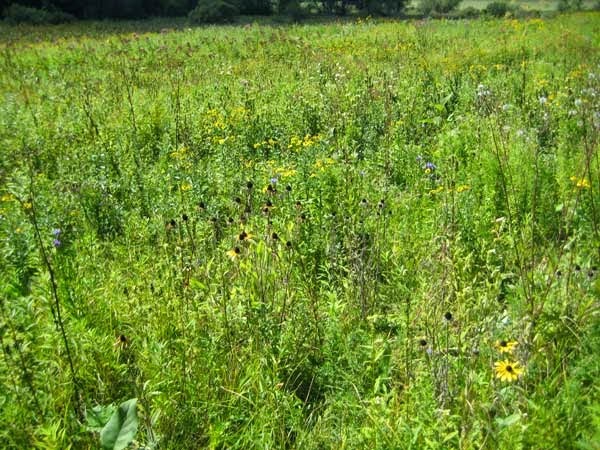 There were 8 plants scattered over this 16 acre remnant prairie. So little sumac? How could we be so lucky? Hard work and persistence. Although we started to work on sumac in 2008, it was not until 2011 that we got serious. Using GPS (and GIS) we had mapped all the sumac clones on each site. The details of how we eliminated sumac are given in several posts, which are summarized in this link. I should emphasize that we can't relax just because we have essentially eradicated sumac from these sites. Sumac is a prolific seed producer, and birds move these seeds around very effectively. If we drop our guard, we may soon find new clones. Also, single plants that we have missed have the potential for starting new clones. Restoration work is never finished. I couldn't resist posting this fine image of the signature bur oak at Pleasant Valley Conservancy. The weather has been very fine in late September this year, and with clear skies the vegetation really shines. Although the bur oaks never show much color, the other oak species are starting to turn. The Hill's oaks usually have especially nice color, especially in the borders around Toby's Prairie. Come out and see them! Because of buckthorn's importance, there have been many earlier posts from Tom's Blog. A list of these posts, with URLs, can be found at this link. Buckthorn is probably the most difficult shrub to get rid of in prairie and savanna restoration (it’s at the top of IPAW’s list). Because of its strong allelopathic nature, if unchecked it can form extensive monocultures. There is almost always an extensive seed bank. This is fairly easy to control, and only persists for several years. There are numerous dormant root masses capable of sending up new shoots, and these are a much more difficult problem. Experience has shown that these viable structures can remain alive for at least 15 years, perhaps longer, even if any new shoots they form are mowed or top-killed by annual fire. What I am reporting here are the results of a long-term study I carried out at Pleasant Valley Conservancy. The area used was a small part of a much larger bur oak savanna which was first cleared of buckthorn in the 1999-2000 period. The initial fairly large-diameter shrubs were killed by basal bark treatment with Garlon 4 in oil. After the shrubs had died (which took about two years) they were removed when the savanna was restored. Since then, the site has been burned annually. Despite annual burns, new buckthorn shoots kept appearing every year. Each shoot was part of an extensive underground root mass. Five years ago I decided to see how long it would take to get rid of them. I think I have finally succeeded. The preliminary work for this study was described in a 2011post, which should be read for details on this study. Starting in 2010 I canvassed the site carefully and sprayed with Garlon each buckthorn shoot, counting as I proceeded. In the three early years, when there were lots of shoots, I returned over and over again at 2-3 week intervals. At the end of the season, I made sure that there were no live buckthorn shoots left. The table shows the results. I should emphasize that the effectiveness of my spraying is not in question. Thus, a shoot found in 2012 is not one that had been sprayed in 2011 and not killed. My conclusion is that in this small area there were many dormant root masses, but not all of them left dormancy the same year. Another conclusion is that it is possible to eradicate a site of buckthorn, but the site must be revisited in multiple years. One might ask what effect this multiple spraying might have on the natural flora. That’s a lot of Garlon! I should emphasize that I was careful with my spraying, making sure that nearby “good” plants were not treated. The table below is the species check list I made this year, when no spraying had been done. The diversity is satisfyingly high! Note the presence of Gentiana alba, a State Threatened species. There are actually two separate patches of this species, one of which has numerous stems, and both patches flowered. We've been having Baltimore orioles nesting near our cabin for quite a few years. They build their characteristic nest in a nearby decrepit elm. We ought to fell this tree but won't as long as the orioles use it. Several days ago during a stiff wind the oriole nest, now no longer used, came down and Kathie found it. The structure is impressively complex, as the photo shows. 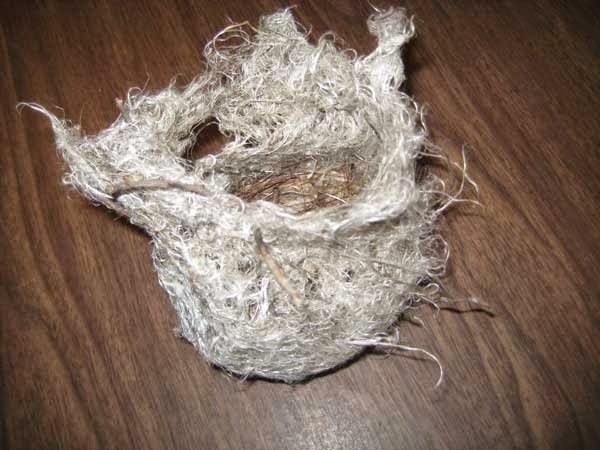 According to the Cornell bird web site, the female weaves the nest from various types of fibers: grass, strips of grapevine bark, and wool, as well as artificial fibers such as twine or fishing line. They may also use fibers from an old nest to build a new one. Males may occasionally bring nesting material but don't help with the weaving. Addition of downy fibers and feathers to provide a soft lining which cushions the eggs and young. They do one brood a year and the clutch size is 3-7 eggs. At lunch we spent some time looking at the structure. Under a hand lens the fibers of this nest looked mostly like bits of cloth, although it was also possible to see strands of plant material. According to Cornell, no knots are tied, but some do arise due to random poking of fibers. It's hard to imagine how someone without hands can make such a structure! When we started restoration about 15 years ago, the parcel under discussion here consisted of a small clone of quaking aspen, about 0.2 acres. The trees were girdled in 1998 and the dead logs were removed 2 years later. 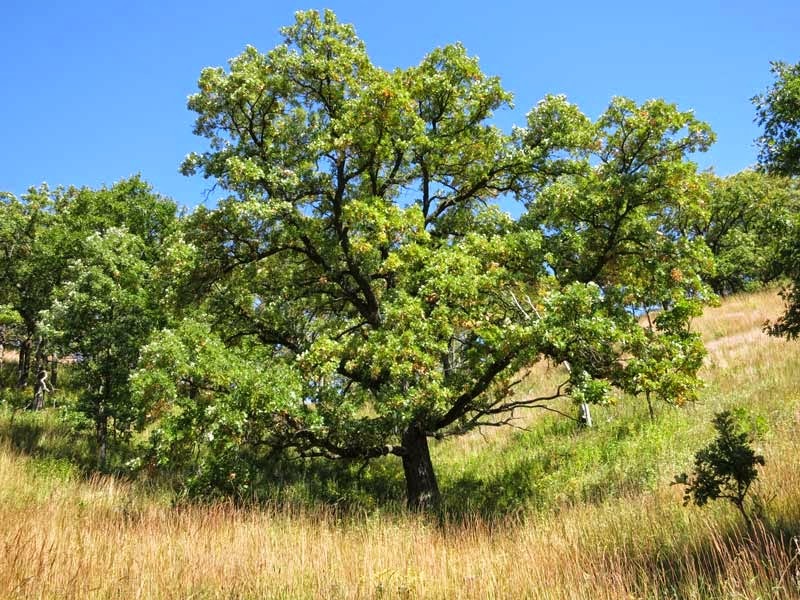 Two medium-sized Hill's oaks were left standing and are thriving. Because this small area was an orphan trapped between our gravel service road and a small CRP parcel (the Ridge Prairie), we more or less ignored it. Although we don't have any specific records, we may have planted it once or twice with a dry-mesic seed mix. However, beginning about 2007 or 2008 it had become mostly a solid patch of Canada goldenrod (Solidago canadensis). In mid-summer 2008 the whole patch was mowed with a brush cutter to try to get a handle on the goldenrod. After that, all we have done is burn it when we burn the adjacent Ridge Prairie. It has been burned annually since then (7 or 8 burns) and otherwise it has been ignored. I never paid any attention to it since I assumed that it was still predominantly Canada goldenrod. Last week I looked more carefully and realized that most of the Canada goldenrod had been replaced with a surprising diversity of forbs and graminoids, including some relatively uncommon species. The table below shows the results of my quick survey. Some of these species probably moved in on their own, since it is unlikely we would have had them in a seed mix. Noteworthy are Lion's foot and stiff gentian, which are hardly "weedy" species. I'm convinced that the frequent (annual) burns played an important role in transforming this parcel from a monoculture to a diverse prairie. It is encouraging to see what burns and patience can bring! Have other prairie restorationists observed this? At Black Earth Rettenmund Prairie a major dieback of Silphium species is occurring. Strikingly, at Rettenmund this has only occurred in the areas that were not burned in the spring of 2014. This die-back was most dramatically revealed with compass plant (Silphium laciniatum), one of the signature species of the prairie, but rosin weed (Silphium integrifolium) is exhibiting the same phenomenon. In other sites (also unburned) in southern Wisconsin, the two other Silphium species, cup plant and prairie dock (not present at Rettenmund), are also suffering from this die-back. As often happens in restoration ecology, this dieback creeped up on me. The leaves of compass plants grew normally in late spring/early summer. Most plants had a lush complement of typical leaves. But in mid-June, no flower stalks developed at the time they normally would appear. Since the compass plants in the areas that had been burned were flowering normally, I knew something was wrong. But what? By mid August all the compass plant leaves had turned brown. 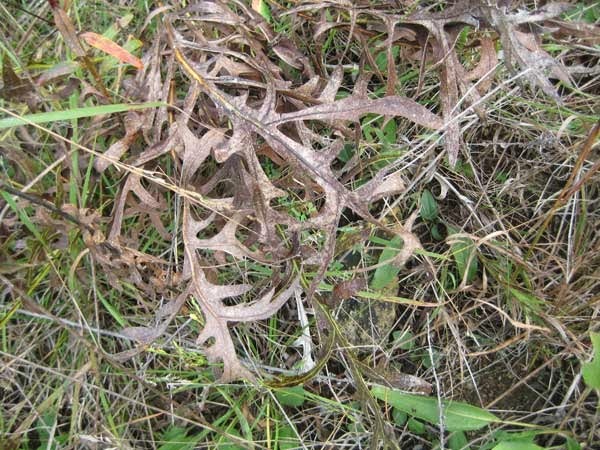 A survey of compass plants at Rettenmund indicated 100% dieback. Because of its structure, the situation with rosin weed was somewhat different. All the rosin plants grew normally but at the time they would be flowering they began to turn brown. The flowers on any plants that had already started developing aborted. Again, 100% effect. Since we did not have the other Silphiums at Rettenmund, I visited a few other sites in Dane County. Both cup plant and prairie dock also showed the same phenomenon. The end result? Unless the site was burned, there may be no Silphium seeds to collect! I am trying to document the extent of this dieback and would welcome reports from others who have experienced it. One more thing. All of the other species at Rettenmund are growing and flowering normally except flowering spurge (Euphorbia corollata), which has also shown 100% dieback. Let me emphasize that sites that had been burned this spring are not exhibiting this dieback. As the photo here attests, fringed gentian (Gentianopsis crinita) is an extremely handsome plant. It was first discovered for us by a participant on our Labor Day 2014 field trip, although Peter Gorman had beat us by a day with his photo on Facebook. Fringed gentian is a characteristic species of wet prairies, and we found it in a newly restored area of our marsh (details below). 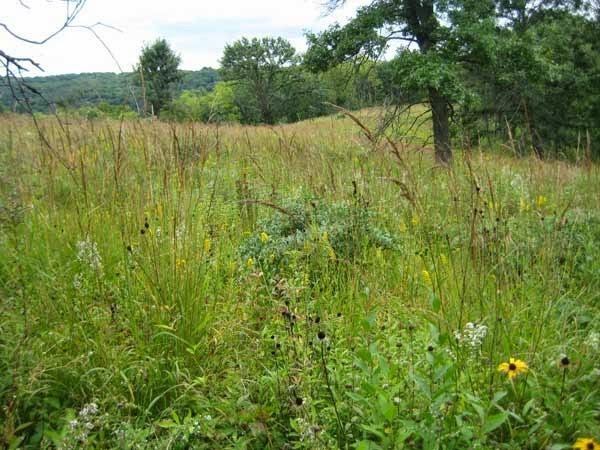 Restoring a wet prairie: Our wet prairie is part of a much larger wetland that is present in the valley of Elvers Creek and East Blue Mounds Creek. Our part of the watershed is a side branch that runs up Pleasant Valley. In addition to a cold-water stream, we have a number of substantial springs that feed the area. The photo below provides an overview of the area where the gentian is present. Originally, this area was a monoculture of Carex trichocarpa, a rhizomatous sedge which forms thick, dense patches through which nothing else can grow. About five years ago, I discovered a relationship between this sedge and lousewort (Pedicularis lanceolata), a hemiparasitic plant (related to wood betony). Although lousewort does not kill the sedge outright, it sets back its growth significantly, making it possible for many other wetland species to grow. We have a good lousewort seed source here and spread the seed into the Carex areas. The link given above and those links it refers to describe the work. Once the sedge was under control, lots of other wetland species got started. But this was only part of the story. We needed fire to complete it. Originally our wetland was burned only as part of a large burn of the whole area. Although this was very beneficial, the space between burns was 3-5 years. This year we decided to introduce annual burns in our piece of the wetland, focusing primarily on the long strip of C. trichocarpa that borders the Valley and Barn Prairies. This was a successful burn, and there has been a great response by the vegetation, as the photo above shows. 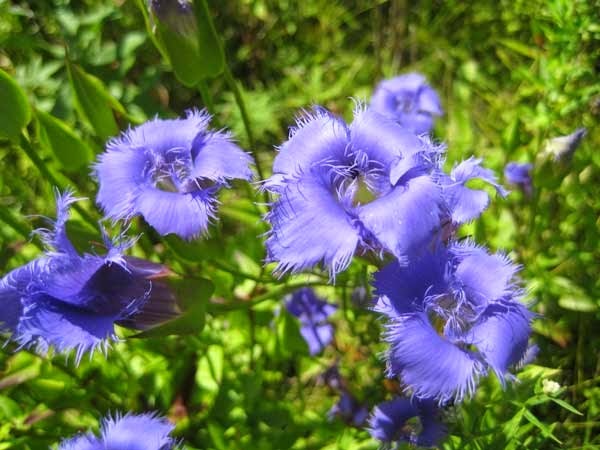 Since fringed gentian is an annual/biennial, its continued presence will depend upon good seed production and subsequent germination and growth. Unfortunately, we won't have a lot of control of that.